You’ve been around long enough to know that some days feel like a Tigger day and other days, you just can't help being a little gloomy. We're here to tell you that on days like these--when you don't feel like bouncing off the walls--it’s OK to just take a cue from everyone’s favorite glum chum, Eeyore, and snuggle up in your pajamas and sit on the couch all day. Often, after giving yourself a full Eeyore day, you return to life restored by the next morning. 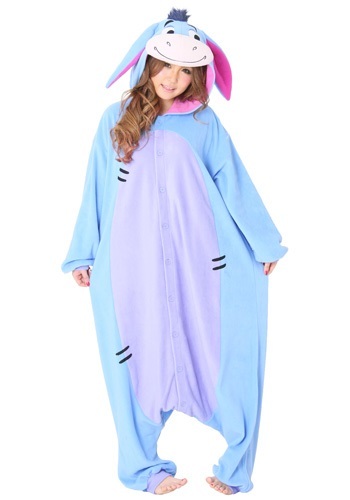 Of course, with this Eeyore Pajama Costume based on the Winnie the Pooh character, you'll be fully prepared for that kind of day. This officially licensed cozy blue jumpsuit allows you to fully embody your bluesy day, so that tomorrow can be full of sunshine and butterflies. We think this hooded outfit may even make you smile. A little. Just for a second or two.